In reality, I could never live with this much white. But boy does it make a statement, especially with that piano. Two thumbs up. I'm determined to do something on the gloomy basement stairs that head down into Shuffler Playland (i.e. playroom). The vibe down there is so happy but you have to take scary, steep, dark steps to get there. This is part of the expanded basement renovation that has yet to happen. Can you tell I'm kind of focused on griping about our lack of progress on this project? THERE IS NO TIME FOR ALL OF THE THINGS. 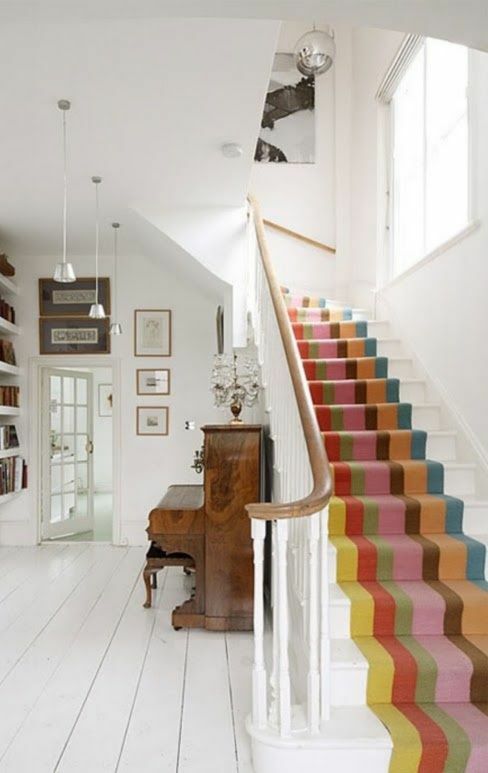 But I'm filing this idea away - I'm digging the white steps with a bold contrast runner. Daniela I wonder if it is Dash and Albert they have perfect designs for stairs!! I was going to say Dash and Albert too. Agree that is a lot of white and agree there is never enough time!